In September 2014 at the AES Convention in Los Angeles, I had a very pleasant dinner with Trent Thompson, the Product Marketing Manager at Moog Music, after which we retired to a covert location in a nearby hotel to discuss synthesizers past, present, and not yet existing. 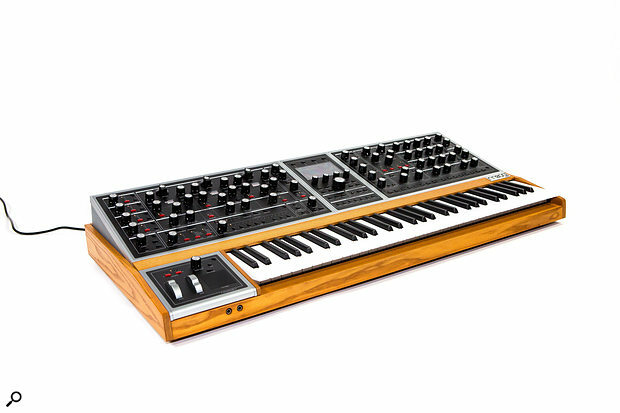 One of the things that we discussed at length was, at the time, nothing more than a concept — a new analogue polysynth carrying the Moog name. But what should this be? A simple but affordable polysynth? Something more powerful with multiple oscillators per note? Something offering layers? Multi-timbral? How about adding powerful on-board effects? Should it be knobby? Should it concentrate on extensive facilities in deep menus? What should it look like? As you might imagine, I had reasonably strong views about much of this, and I remember suggesting that companies rarely do well when they fly against the market’s perception of what they’re there for and what they’re good at. 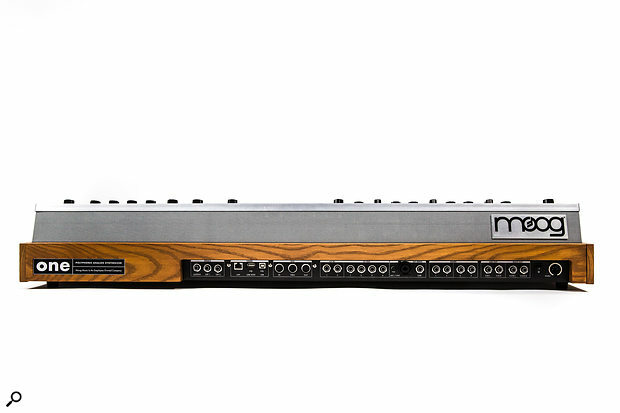 I also remember suggesting that the Memorymoog has cast a very long shadow and that any new Moog polysynth would have to do more than just nod in its direction. The rest is a bit of a blur. We talked long into the wee small hours and, no doubt, staggered into the Convention the following day a little the worse for wear — or, to be more precise, for lack of sleep due to too many diet colas. Little did I know that I was one of several people having this conversation with Moog’s powers-that-be. The principle of developing the first Moog polysynth in 30 years had been agreed in July 2013, and these conceptualisation meetings (or market research as you and I would call it) took place with key players in the industry and friends of the company over a period of more than two years, during which time a spreadsheet of responses — many of them conflicting — was populated with the huge amount of feedback obtained. Once the information was collated, it was necessary to translate the responses into an instrument concept and, in the autumn of 2015, hardware development — both mechanical and electronic — began. The first PCBs were populated in early 2016 and the first prototype was built in mid-2016. Of course, this looked nothing like the synth that you see today. The boards were mounted on lumps of wood and the case was a mock-up, but things were starting to come together. The synth now entered a period of rapid technology validation and refinement and, early in 2017, I was invited to Moogfest to see and play a working prototype. Such had been the secrecy surrounding the synth that, when I arrived, only a handful of the company’s own staff had seen it. This wasn’t altogether surprising because, until the second day of the festival, it was little more than the set of prototype circuit boards, still mounted on their various lumps of wood, and they had never been assembled into an integrated whole. So I stood back and watched as the various boards and oLED screens were fitted into a prototype case that had never before hosted any electronics. 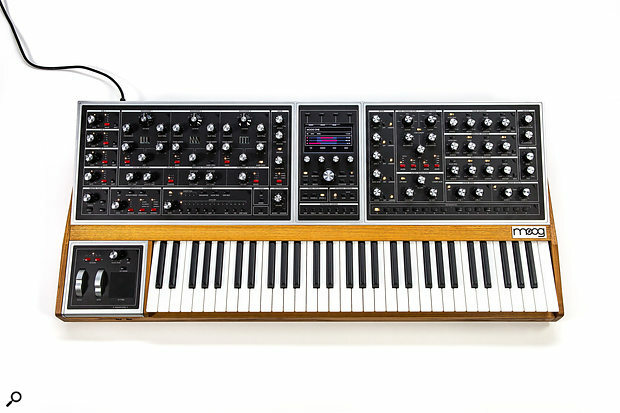 Over a period of three days or so, the new synth – which looked like nothing so much as a 21st century Memorymoog – was constructed in a super-secret location above an apartment a couple of hundred yards from the Moog Store at the festival and, as it took shape, it became clear that the instrument was going to look resplendent. The design wasn’t finalised but, I was told, was pretty close, and certainly close enough to get a feel for what it might eventually become. Mind you, it still wasn’t possible to switch the thing on, press a key and have a note come out. The control software still ran on a laptop computer and had to be downloaded on each occasion, and the communication between the computer and the synth’s brain was still, umm… less than entirely reliable. But the day before the end of the festival everything seemed to be running and I was invited to press a few notes and become the first person to play the Moog… Something. Was the sound that emanated from it a glorious sonic explosion that heralded the birth of a new era in polyphonic synthesis? To be honest… no. It was an atonal fart that died almost as soon as it had been emitted. Much scratching of chins ensued, half a dozen large pizzas were consumed, and a few hours later we tried again. This time, I played something that was nearly an approximation to something that sounded almost like a synthesizer, and this was enough for Moog’s engineers to begin the process of troubleshooting and software enhancement. Over the next 24 hours, various people hammered away at the laptop, and things started to come together. The following day, they had all of the oscillators running and staying almost in tune with one another, LFOs began to affect the oscillators and filters in sensible ways, and contours started to shape things – sometime even as they should. But all too soon the festival was over and the engineers drove back to Asheville with my suggestions (some of which were eventually adopted, others not) ringing in their ears while I flew to Asia for the next stage of my trip. 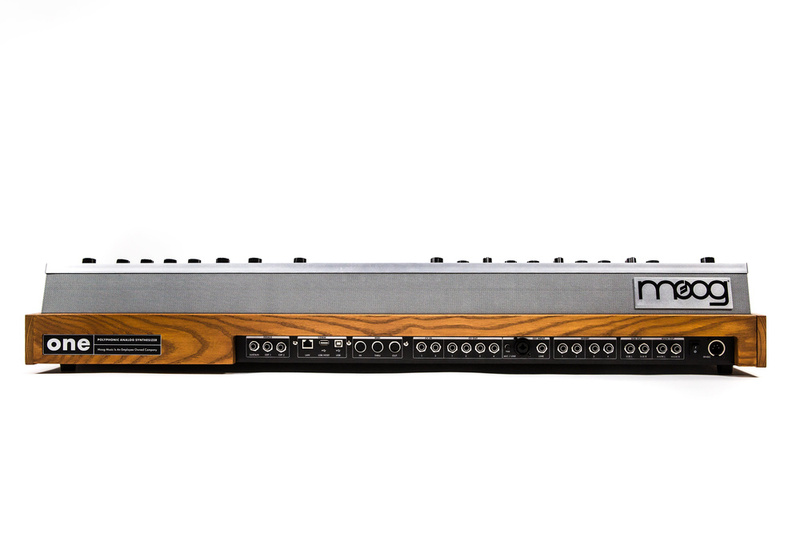 Following this, the synth (now codenamed the LAS, for “Long Awaited Synthesizer”) entered a second phase of development. The core technology had been proven, but there was a huge amount of refinement needed to turn it into a musical instrument. This work continued until July 2018 when a pilot production run was undertaken, and the first production units of the newly named Moog One were completed in August 2018. Now that it’s done and within just days of release, it looks and feels exactly like a big analogue polysynth should. All of the sections in the signal path are implemented in the analogue domain; three newly designed oscillators per voice, an innovative noise generator, a flexible filter topology with a combination of multimode and Moog transistor ladder filters, and VCAs that you can overdrive to obtain the expect range of heavyweight sounds. However, this is only half of the story because, as you would expect, the One is a hybrid, with extensive digital control over that signal path. Central to this is the modulation matrix, which offers a large number of sources and destinations, although I can’t quote you numbers because this is one of the areas yet to be finalised. Other digitally generated facilities include multiple contour generators and LFOs and, if you’re happy to see your signal pass in and out of the digital domain, there’s an effects section that offers one effect per part, plus two master effects. (As found on some polysynths from elsewhere, the effects lie in side-chains so that, if you bypass them, you can ensure that the audio signal remains in the analogue domain if that matters to you.) 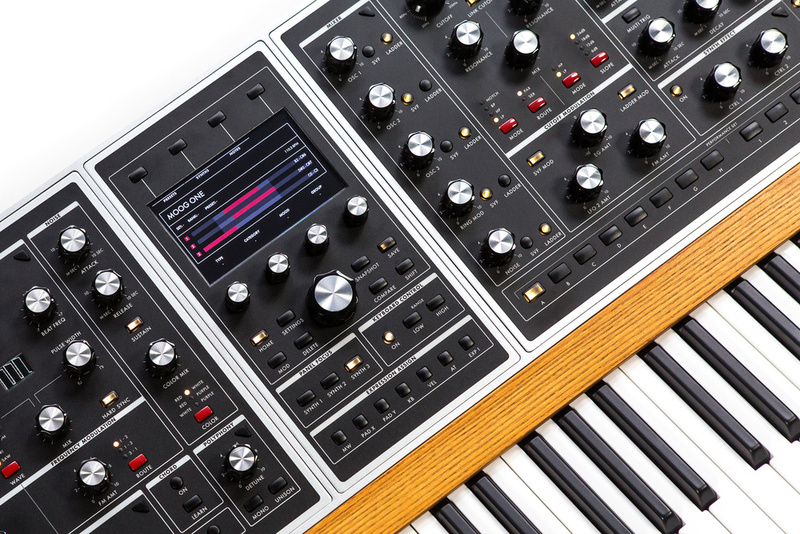 Many of the effects algorithms have been developed in-house, but Moog has also collaborated with no lesser developer than Eventide for the One’s reverbs. Hang on… ‘per part’? In a move which I suspect will be a surprise to many, the One is three-part multi-timbral, and it’s simple to determine how its 8 or 16 voices (depending upon model) are allocated to these parts. Furthermore, the voice management and control software appears to be able to support 16 further voices, which suggests some intriguing possibilities for the future. But for the moment at least, the plan is to launch two models – an extensible 8-voice version, and a fully populated 16-voice version. As for the sound, I’ve spent the past week in Asheville helping to find bugs while creating patches for the One and I like what I’ve heard so far. Sure, there are still things to be sorted out before its launch, but the omens are good. 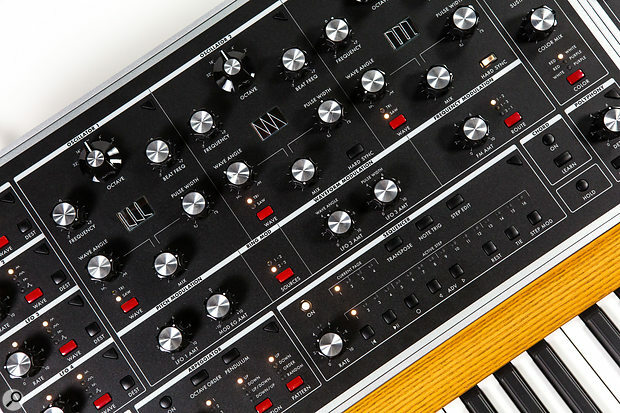 Although I love my Memorymoog, I was never a huge fan of it in live situations, not because it was bad synthesizer – far from it – but because it almost always sounded too strong, too powerful; far too often, it said “Oy! Listen to me” even when you wanted it to sit back in the mix and let someone or something else enjoy the spotlight. In contrast, the One offers far greater flexibility. Sure, it can fulfil the role of a 21st century Memorymoog, but its palette is much wider, ranging from delicate and aetherial pads to the most powerful monosynth leads and basses. If you're a lover of synthesizers, don't miss SynthFest UK, this Saturday 6th October in Sheffield. Get your tickets now!